Manufacturer of a wide range of products which include innovaz-ime dispersionizer, innovaz- lm nano sonic system, innovaz hsd dissolver, pmk planetary kneading mixer, innovaz trl-h inline disperser and innovaz trl-c dispersing machine. InNovaZ® IME Economic Dispersionizer Economic Dispersionizer Taking Dispersion One Step Further Successful dispersion requires targeted force in order to separate agglomerated particles. The InNovaZ® IME Economic Disperser applies dispersive forces then and there, where they are especially effective, in the InNovaZ® IME disperser body, energy is transformed into very high speeds under pressure. Economic Disperser applies dispersive forces then and there, where they are especially effective: in the InNovaZ® IME disperser body, energy is transformed into very high speeds under pressure. Turbulence and cavitation in i perfect combination with specifically-applied shearing forces ensure maximum dispersion results. In addition, the system can be easily adapted to different operating conditions or formulations thanks to the InNovaZ® IME disperser body, which consists of a nozzle with infinitely adjustable flow properties. InNovaZ- LM Nano Sonic System Small to medium scale electrode slurry production InNovaZ LM system has shattered conventional wisdom in mixing, giving rise to totally new technologies. The thin-film, spin methodology ensures sharp distribution of nanometer-sized particles that has been impossible with conventional mixers. High speed revolution of turbine causes materials to form a thin film along the walls of the vessel. InNovaZ LM system has shattered conventional wisdom in mixing, giving rise to totally new technologies. The thin-film, spin methodology ensures sharp distribution of nanometer-sized particles that has been impossible with conventional mixers. High speed revolution of turbine causes materials to form a thin film along the walls of the vessel. Because the centrifugal force is greater than gravity, the material is mixed in a closed-in space where a significant energy can be applied to it. LEIMIX® offers batch and quasi-continuous processes using InNovaZ LM system. The well-established technology by LEIMIX® enables the production of high-quality electrode slurries, i.e. for the anode, cathode and the separator Iayer. The high-speed, thin-film method of dispersion using InNovaZ LM system allows for sharp particle size distributions and uniformity in dispersions of nano-meter sized particles. The highly efficient, turbulent mixing process results in better battery qualities - for example charging/discharging behavior and lifespan - due to the homogenous dispersion of the conductive carbon in the active material of the cathode slurry. Consistency in particle size without any damage to structure. Ideal for battery slurry and other such applications. Inspirational mixing and dispersing Technology,The compact enclosed design of the intensive mixer allows for integration into fully-automatic plants and prevents contamination from gases and dust. 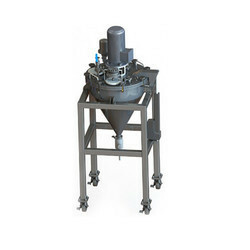 The HSD Dissolver is used for dispersing solids in liquids. The product is mixed in batches in an exchangeable tank. 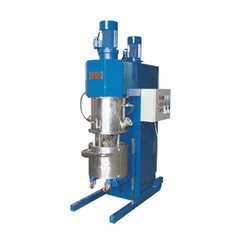 In all application ranges for wet grinding and dispersion, the result of the entire process is dependent on the quality of the pre-treatment, i.e., mixing and pre-dispersion of the raw materials. LEIMIX can supply the suitable solution from individual mixing units through to complete production plants. 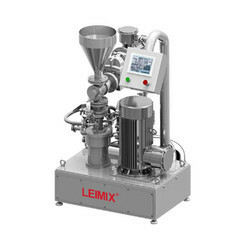 LEIMIX offers different column mixers dependent on application and product viscosity: High speed dissolvers for per-dispersion, butterfly mixers for high viscosity products and twin-shaft mixers for combined mixing and pre- dispersing. Low-speed stirrer and high speed disperser shaft mounted on the jagged scattered disk/ shaft speed emulsion emulsion as both head rotation, but also for the revolution, combined with low clearance paddle design, no dead ends, so that the material to produce low-speed paddle strong kneading motion and interference and Pan / Tilt circular motion, as well as high shear. Low-speed stirrer and high speed disperser shaft mounted on the jagged scattered disk I shaft speed emulsion emulsion as both head rotation, but also for the revolution, combined with low clearance paddle design, no dead ends, so that the material to produce low-speed paddle strong kneading motion and interference and Pan / Tilt circular motion, as well as high shear to break up and emulsify head emulsification dispersion plate of homogenization; thus ultimately ensure adequate dispersion of the material / homogeneous and uniform blending (mixing). InNovaZ TRL-H inline Disperser Using the new concept of gentle dispersion technology form pressurized humidifying, the combination of vacuum breaking, cutting and pressure wetting can disperse and defoam evenly The InNovaZ TRL-H inline premix disperser combines a new dispersion method, in which the solid components are wetted on a large liquid surface, with emission- free, dust-free inline operation. The combination of vacuum dispersion. all at high efficiency levels in a controlled process. process temperature-sensitive or dilatant materials. large batches and is particularly well suited and specially adapted for emission-free and explosion-proof operation. High speed revolution. It can accelerate the turbulent diffusion and volume diffusion of the powder. InNovaZ TRL-C Dispersing Machine, the New Inline Mixing Experience In 2016 invention patent, Chemical Engineering Society TechnologyAward was obtained. 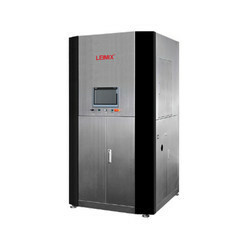 With the InNovaZ TRL-C , LEIMIX offers a new, compact solution for producing homogeneous dispersions with reproducible quality in an inline process. Here, the dispersion process takes place in an atmospherically sealed processing chamber and is thus dust and emission free. In 2016 invention patent, Chemical Engineering Society Technology Award was obtained. With the InNovaZ TRL-C , LEIMIX offers a new, compact solution for producing homogeneous dispersions with reproducible quality in an inline process. Here, the dispersion process takes place in an atmospherically sealed processing chamber and is thus dust and emission free. The InNovaZ TRL-C inline disperser is operated in circulation mode, whereby the powder can be fed from a bag via suction lance or bag feeding station. Alternatively, it can be fed via BigBag or from a silo. The InNovaZ TRL-C operates similarly to a feed pump. Through optimal flow control, a negative pressure is created in the processing chamber during operation. This negative pressure is used to draw in the powder, whereby, in combination with appropriate powder delivery, introduction of external air is minimized. Here, the wetting process is not based on the classic rotor-stator principle, by which dispersion is achieved through high shear rates. The principle of the InNovaZ TRL-C is based on the introduction of the powder under negative pressure in a continuous, large liquid surface. Due to the pressure gradient between the supply and delivery sides, the liquid is pressed into the agglomerate structure such that, within a very short period of time, the individual particles of the solid are almost ideally wetted. Because of the low shear rates, the energy input is significantly lower than for conventional rotor-stator systems, which means that a smaller increase in the product temperature is achieved. InNovaZ TRL- B Plant Dispersing and Defoaming Machine Intelligent powder and liquid mixing and grinding working station One step can realize mixing and grinding power and liquid at the same time. Principle of equipment TRL-B system is the automatic powder and liquid mixing and grinding system which is researched and developed independently by LEIMIX and PUHLER.This working station can maintain dynamic balance of powder and liquid during the mixing process. 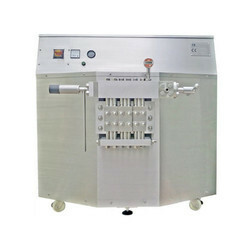 Intelligent powder and liquid mixing and grinding working station. One step can realize mixing and grinding power and liquid at the same time. emulsifying and grinding steps in one machine. Some traditional equipment and disposing steps are completely eliminated. As for dust-free and loss-less absorbing powder, even though it's hard to be wet, dust powder is easily cleaned, the raw material can absorb and disperse powder directly from cylinder silo (middle buffer), container bag, hopper, bag, barrel, etc. The advantage of multi-functional TRL-B system is that it is assembled and set with modular components, it's main shaft/mixing head and grinding rotor can be simply changed. 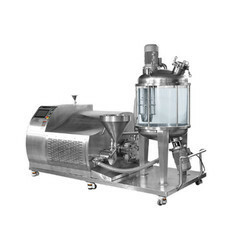 As for dispersion and mixing system for complicated condition, stirring system, emulsifying system, heating system, weighing system, vacuum pressure system, temperature and pressure sensing system, online test system can be used to research and produce Nano slurry, carbon Nano tube, inkjet, grease, chemical synthesis reaction, and high-viscosity material mixing. The testing type and manufacturing type are for your choice and modular customization is provided as well. System integration and combination working station is adopted. According to different application requirements, choose SUS304 or 316L stainless steel, zirconia ceramics for manufacturing. The whole equipment system is relatively closed, clean, sanitary, safe, beautiful and easy to be operated. Online diffusion pump makes use of the working principle of high shear rotor-stator. Narrow clearance between rotor and stator, and high liner velocity of external ring drives rotor and produces strong shear gradient and vacuum negative suction force. Product in rotor gears is forced into shearing area through grooves, and enters grinding system under the centrifugal force of stator groove. A Nano grinding machine with full-size and strong power is the necessary part of this system, assuring high working efficiency, safety and reliability. Rotor with large radius produces vacuum self-absorption system with large absorbing ability, providing transmission force for the whole working station and providing power for solid material and liquid slurry. The machine is the most economical selection for grinding large amount of materials, and its investment and cost of grinding medium are relatively low compared with other grinding equipment. Completely change traditional grinding concept and technology, and grinding structure is changed and overthrew in terms of quality. 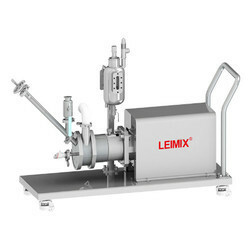 LEIMIX TP Vaccum Aerator System Remove micronized Gas and Air Pockets with the LEIMIX Vacuum De-Aerator In the LEIMIX Vacuum De- Aerator, micronized gases are removed from fluids with a wide range of viscosities. By means of the VTRU Principle (vacuum - thin-film - rotary ultrasonic (waves) process), it is possible to process products from offset ink and shampoo, for example, to a wide variety of free- flowing compounds. In the LEIMIX Vacuum De-Aerator, micronized gases are removed from fluids with a wide range of viscosities. By means of the VTRU Principle (vacuum - thin-film - rotary ultrasonic (waves) process), it is possible to process products from offset ink and shampoo, for example, to a wide variety of free-flowing compounds. The throughput is product and viscosity dependent and can range from 200 to 5000 kg/h. This machine can be used to de-gas both small quantities, from interchangeable tanks in batch operation, and large batches in continuous operation.